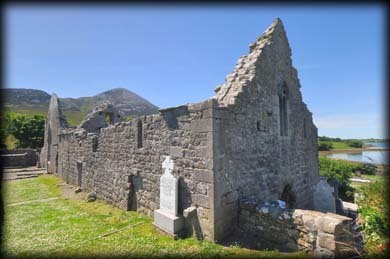 Murrisk Abbey is ideally situated on the southern shore of Clew Bay below the sacred mountain Croagh Patrick. It was founded in c.1456 by a local chieftain Hugh O'Malley who granted the lands to the Augustinian friars. Murrisk has now become the main starting point for pilgrimages to Croagh Patrick. 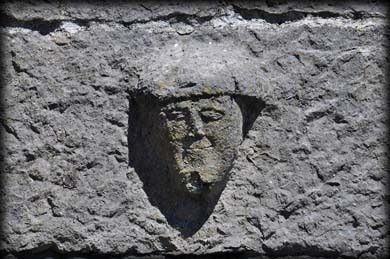 Some modern pilgrims still prefer to take the more traditional route from Ballintubber Abbey via Aghagower along An Tóchar Phádraig - St Patrick's Way. For the more serious walker there is a 61 kilometre way marked trail from Balla to Murrisk known as 'The Croagh Patrick Heritage Trail'. This walk incorporates An Tóchar Phádraig. 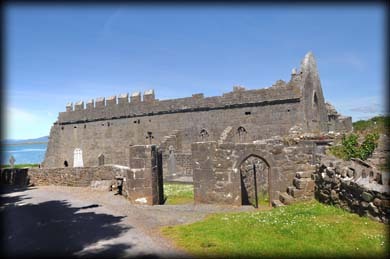 The ruins are L-shaped and consist of a long narrow church, with battlements along the south wall, and a domestic building that runs north from the eastern end of the church. This building would have bordered the now disappeared cloister on the eastern side. It contained the chapter house at ground level and the dormitory above. A bell-tower was inserted into the church at the west, but only a ribbed vault survives. Pictured above are a few of the large variety windows at Murrisk. 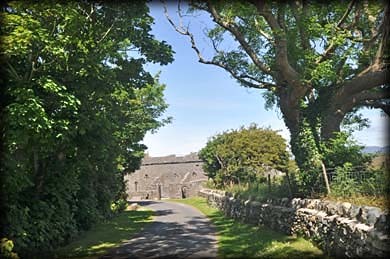 This is a nice compact site in a very tranquil setting just 140 metres north of the National Famine Memorial. 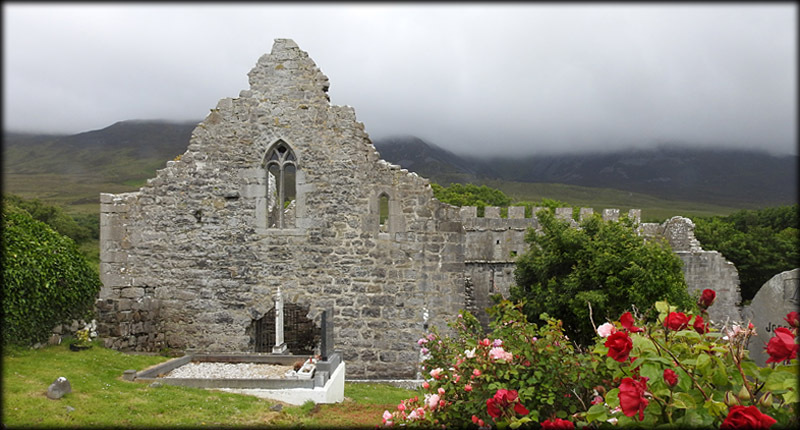 Situated: The abbey is located on the opposite side of the road to the Croagh Patrick car-park in Murrisk. Walk down the road passed the National Famine Memorial. Discovery Map 30: L 9194 8263. Last visit June 2014.